Michael Hassall graduated from NAIT’s Culinary Arts program in 2006 and has spent the past decade working in restaurants overseas – at the Blue Water Grill in Perth, Australia – and in Canada, most recently at the Windermere Golf and Country Club and vivo Ristorante in Edmonton. 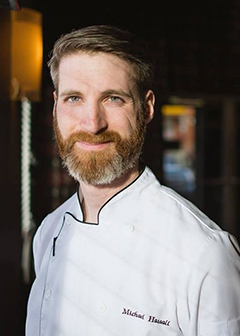 His diverse background has contributed to his unique cooking style, in which he mixes classic and modern techniques with a heavy emphasis on “in-house” cooking with seasonal and local produce. Michael believes the first step to producing amazing food is using amazing ingredients. Food and agriculture go hand in hand and it is important to support local farms and businesses, especially those who follow sustainable agricultural practices and deliver superior quality products. Some of Michael’s favorite ingredients come from Country Accent Heritage Breeds (Mangalitsa pork) and Sundog Organic Farm (produce). Knowing where your food comes from and how it is raised is the future of health living. Michael strives to create a working environment where everyone feels like they belong to a team and contributes to overall success. He believes in change, diversity and inclusion, and anyone who has worked in the restaurant industry knows that every day brings new challenges and experiences. This is what Michael enjoys about restaurants and life! Michael’s life outside the restaurant is spent mostly with his wife and 2 dogs. They enjoy long walks and day trips around the city. Summers are full of rugby, fishing, camping and gardening. In the winter, he enjoys scotch, reading sci-fi and fantasy books. And when the winter weather turns nice, you will find him at one of the many cross-country ski parks Edmonton has to offer.